Internet Blackout, Will it Work? In last two days, internet sphere is going through lot of developments. Blasphemous drawings are a cause of deep concern for every Muslim. We all are reacting with anger, grieve or whatever power we bear in our hands and hearts. 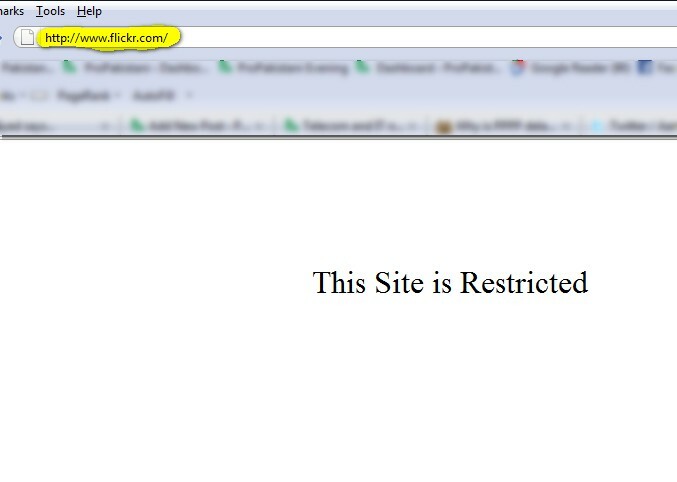 We saw Facebook disappearing from Pakistani’s Internet then the YouTube, Flickr is gone too. 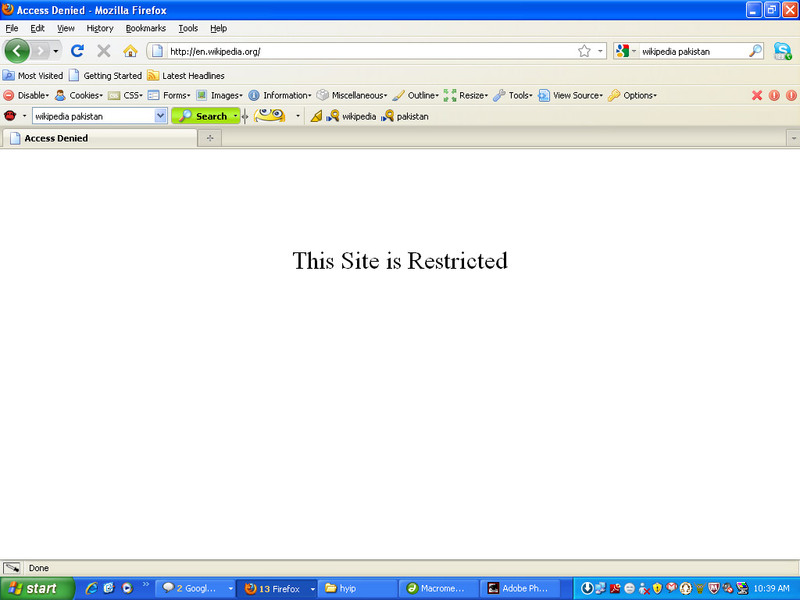 Some say they have seen “Site is Restricted” message for Wikipedia and Google too. Talk about Blackberry services: No more! Okay, let’s discuss what are our goals? What we want to achieve? Answer would be: We want to make the western world realize that their drawings hurt our feelings, and we don’t want them to play with our religious beliefs anytime in future. Also they must talk to other Muslim countries, brief them the situation and take a collective action. Now let’s measure our actions (internet blackout) and equate them if they are enough to take us to achievements? Like lot of people think, a ban on Facebook and Youtube will cause them monetary loss, ultimately taking them to their knees. In fact while I am writing this, Dunya News reported that Pakistan has caused Facebook a loss of USD 2 billion, a similar misleading SMS is circulating the country too. I wish this was the situation, but that’s not true. Facebook revenues are set to reach 1 billion dollar this year, which is, by the way, more than entire telecom industry of Pakistan. If Facebook has 400 million registered users than it means one users earn Facebook around $ 2.5 a year (roughly). With 2.2 million Facebook users from Pakistan, Facebook earns around 5.5 million dollars in a year. Divide it by 365 to get revenues for one day from Pakistan. In short, they are so huge that we can’t jolt their balance sheets with our 2.2 million users in Pakistan. Now what to do in this situation? Given that our Government’s impression is not very well in western world. I doubt our president is taken any serious in White House, I also doubt that our Foreign Minister is given more respect than just a mayor in US. (Sorry guys don’t want to hurt you but let’s face the fact). There is no question that Facebook or other web companies are discriminatory, as it’s pretty clear from their deeds and previous track record, but assuming above mentioned circumstances, what are options left for us? Block the whole internet? NO: Why? Because it’s not going to impact these web giants. Media, guys you are lame here. You bring on all sorts of experts on whatever topic you discuss (be it politics, law, international affairs etc), but what happened here? Why you guys are not highlighting the issue? You think it’s not worthy? Come’on whole web 2.0 is down in this country, and you are giving 2 minutes out of 60 in one hour? Along with above two points, our talent must gear up now (maybe backed by government) to get us web luxury of our own. This is a lesson for us that we will suffer if we will keep relying on western technology. Let’s say it will take 5 years to get a Facebook replica of our own, but start it today as time is ticking. This incident teaches us of actions, wise ones. I think our media is getting paid by jews to keep quite. I mean what the hell?? they reported even about wedding clothes of shoaib and sania and about this matter.. they are quite like they don’t have any tongue in their mouth!! SHAME ON GEO, EXPRESS and all other big money making lamers!! I can’t understand why they have restrict Wikipedia I don’t think think tht Wikipedia is showing and blasphemous drawings in fact it is one of the largest source of information we get from web….For instance I myself use wiki a dozen times in a day just to get info about anything. By restricting Wikipedia are not getting any good out of it..
Ammar bahi your idea is very good. shame on all those who are blaming and making fun of our govt. in one way or other. i think you people haven’t seen those drawings, if you had seen those u wouldn’t have said this. i am sure u would not have tolerated those cartoons for ur parents. how can u think about exceptions when it comes to prophet muhammad(saw). i this u don’t know who prophet muhammad(saw) was. “None of you becomes a believer until I am dearer to him than his children, his parents and all mankind.” (as reported by Bukhari and Muslim) Some versions add: “his life, his wealth and his family”. you are right Aamir that this will not be able to put even the slightest of dents to the overall earnings of FB. Just as you have mentioned in another article about Pro Pakistani’s resolve, I myself have also resolved not to use FB ever again in my life. The basic intention behind my resolve is not to cause a financial damage to them…the reason is…I can not think of re-visiting the place where Prophet (PBUH) got insulted (Na-ooz-u-Billah. Its just a way of telling who-so-ever might listen that my feelings have been crushed by this brutal act. Similarly, all the Muslims (at least a significant majority) must be having the same feeling. So I agree that the basic intent in our hearts should be to detach ourselves from someone who is being indecent about our religion. Being realistic, I know that this might turn out to be just a meagre cry of anguish and very few might notice it…and for the world to notice and act … I can only pray that the snoozing religious integrity in the influential circles of Muslim world wakes up somehow. But till then, atleast i need to keep my conscious clear … on the day of judgment … i cant think of any excuse which can justify my re-establishment with those who have committed this un-forgivable act. As for having alternatives, I 100% agree with you…it might be far far away … but there has to be a beginning. “A journey of thousand miles begins with a single step” … and if the step is taken for the sanctitiy and integrity of our religion and our Prophet (PBUH)… and if the intents are honest … why wouldn’t The Allmighty help us in achieving the destination. May Allah bless us all … as HE is THE BEST JUDGE of right and wrong. I’m afraid this whole thing is getting too far out of hand. Are we now going to let the west dictate what sites we can view and what we can’t? Shame on the PAKISTANI MEDIA …..they are showing their interest only in showbiz and politics. they are just making money . well banning facebook , youtube was good.. But why did they ban wikipedia? Aamir you have given a great ideat that we should come up with our own web tools like facebook. Although it will take time but nothing is impossible. As far as blocking facebook is concerned this is a great initiative taken by PTA. If other muslim countries follow it and ban facebook in their region until blasphemous pages are removed then it will be a big loss for facebook and they will ultimately have to remove those pages. I agree that $ 2 Billion figure is misleading but muslims are more than a billion in this world. Their contribution in facebook revenue will not be a small figure. PTA should only block the whole website of facebook. They shouldn’t block other websites like wikipedia complete. Only blaspehmous URLs of other websites can be blocked. Only English version of Wikipedia has been banned. It is working in other languages. china has also banned the google and making its people to use its own search engine. and the people who stopped using facebook or banned can atleast say we left the place where u were insulted, we were against them. do u think Hazrat Muhammad (PBUH) will love the people who are showing sympathy for facebook? nothing is more important than our Prophet (PBUH)..
Facebook is demolishing our youth, they are wasting their maximum time on using these sort of websites or other material. kindly open your eyes and think, this world is temporary, prepare for what is permanent. Mr. Mehdi! I strongly agree with your view point. May Allah bless you and all of us! This is period of Fitnas. They should have been made at now !!! Thanks to amir bhai for such a great website propakistani. Thats true aamir atta if 10 or more people like you sit together than they can make a more good website than facebook i have a model i own it having some hosting prob in pakistan may it can help us to make our own facebook…. I don’t agree with the “financial analysis” made in this article. I think all Muslim Countries MUST ban and block “facebook”, “youtube”, “twitter” and all those sites whose sponsers are Jews. Thanks for taking this possibility to discuss this, Personally i think strongly over it and I reap the benefits of garden greenhouse structures this subject. If at all possible, as you gain data, please update this web site with new information. I have discovered it extremely useful.